Bed bugs can attack clean as well as dirty rooms, but regularly washing your bedding will help kill any bed bugs that may have strayed onto your bed. Washing your clothes and linen is one of the easiest ways to try to keep bed bugs at bay. The washing machine can dislodge any bed bugs or bed bug eggs that attach to your clothes or sheets, and the hot temperatures can kill many of them as well. Bed bugs are killed at temperatures above 120˚F so make sure you wash your clothes and linen on the “hot” setting. After washing, put them into the tumble dryer and then dry on the hottest temperature setting. For dry-clean only clothes, you can either take them to the dry-cleaners or dry them in the dryer on hot (without wetting the clothes). Please warn your dry-cleaners if you have bed bugs. There are also suggestions that not all dry-cleaners may be free from bed bugs since not everyone is conscientious enough to warn their dry-cleaners when they get a bed bug infestation. Sometimes, they may not even notice that they have a bed bug infestation. That’s why I don’t suggest using a dry cleaner if you can help it. Catching bed bugs early on can turn a potentially gigantic infestation into a mere annoyance for a few days. Use light colored sheets on your bed and look regularly to see if you can detect any small dark brown or reddish dots or streaks on them. Look for these dots or streaks on the side closest to your mattress as well. If you don’t have a bed bug protection mattress cover (see step 3 below), then you should also check your mattress for these signs. You can put vaseline or double-sided tape on the legs of your furniture or use a simple device like Climbup to trap bed bugs climbing up or down from your mattress or get bed bug monitors, which catch bed bugs by simulating human breathing. If you do manage to find a bed bug or signs of bed bugs, don’t panic. If you’ve been implementing these steps, then you won’t have a large infestation. 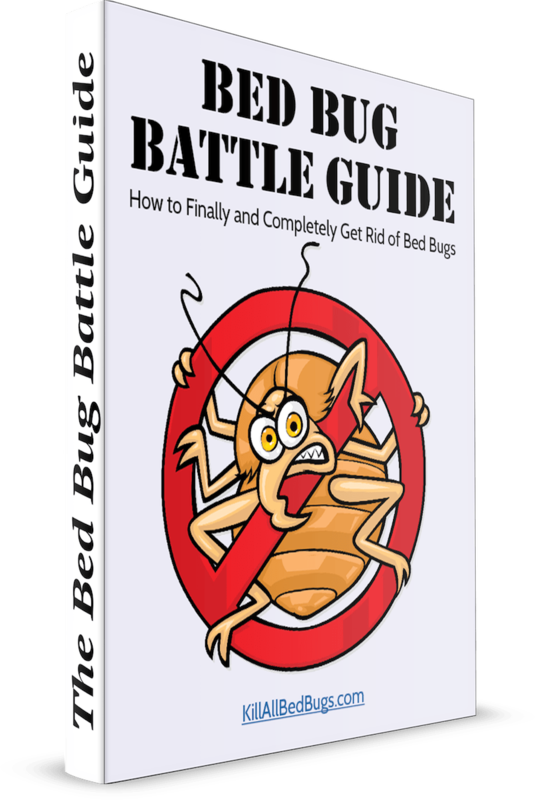 If you do have bed bugs, then go to the Bed Bug Extermination page to read about how to get rid of those few bed bugs. There are several other methods of detecting bed bugs early. Go to the Bed Bug Signs page to read about them in depth. Please note that the most unreliable method of detecting bed bugs is seeing bites on your skin. 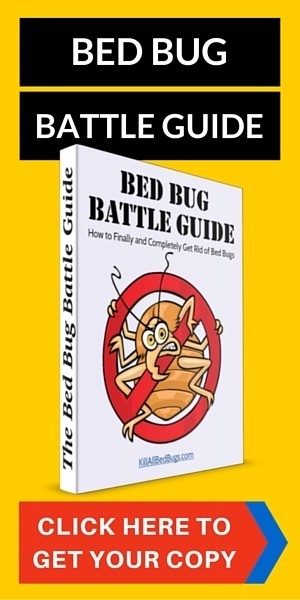 There are so many different ways of getting bites and bed bug bites are relatively unlikely actually unless you know you have bed bugs for sure. Most people that think they have bed bugs because they see bites on their body when they wake up in the morning are actually wrong. It’s usually bites from another insect (e.g., mosquito) or else an allergic reaction to something. Protect your furniture and prevent bed bugs at the same time. There are bed bug proof covers (or encasements) for your mattress and your box springs available to buy. These basically seal up your mattress or box spring so that bed bugs can’t get into them. Some of the mattress covers are made from plastic, which can make your bed rather uncomfortable and hot unless you put a thick layer of blankets between your sheet and the mattress. Be careful when buying mattress covers as not all of them will prevent bed bugs. 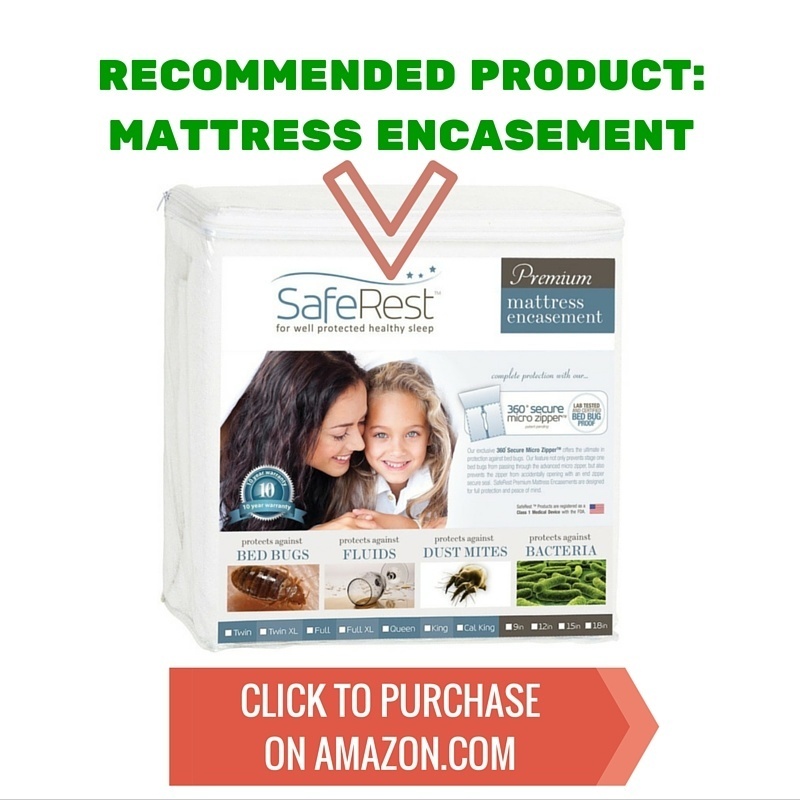 We currently recommend the SafeRest and the Allerzip bed bug mattress covers as they are designed to be comfortable to use and to protect against bed bugs. You can purchase both on Amazon.com. If you’re considering buying furniture right now, avoid buying used furniture if you can afford to. (For more about used furniture buying click here.) It’s difficult to determine whether the used furniture you’re buying has bed bugs or not even if the seller tells you that it doesn’t. Bed bugs can live in wood as well as fabric. Consider buying furniture made out of metal, plastic or leather as bed bugs cannot live in these materials. However, bed bugs can still live in any crevices that may be in your furniture. Obviously, we can’t let bed bugs run our life, although some people who live in constant fear of bed bug attacks do end up living a restricted life so as to avoid potential contact with bed bugs. Just be sensible. Avoid bed bug infested locations. Keep up to date with places that have been infested with bed bugs and try to avoid them. If you do go to somewhere where bed bugs have been reported, try to wear clothes that are easily washable so that you can wash your clothes as soon as you get home and then take a shower. Many people bring bed bugs home after traveling. Hotels are notorious for harboring bed bugs. Many hotels are incompetent or simply ineffective at exterminating bed bugs infestations. Read reviews of hotels before booking them. If several recent reviewers complain about bed bug problems at the hotel, then try looking for a different hotel rather than taking that risk. If you are traveling soon, then check out our guide below on preventing bed bugs when staying at hotels. Hotels are often notoriously bad for bed bugs, so it’s important to avoid getting any bed bugs and bringing them back to your home when you stay at a hotel. So, here are some tips for preventing bed bugs when you’re traveling. Even if you read glowing reviews about your hotel and there were no mentions of bed bugs online, please still check your room when you first arrive. It’s a very quick and simple check that takes a few minutes and could save you weeks of pain and suffering and a lot of money as well. Simply lift up the sheets and any covers and check the mattress for any stains (look for small dark reddish spots and stains on the corners of the mattress and around the seams). Lift up seams and check carefully around them as a small infestation won’t leave many signs. Don’t bring your suitcase in when you do this check. Leave the suitcase by the door, away from the bed. And don’t open your suitcase yet. Just because you don’t see any signs of bed bugs on the bed doesn’t necessarily mean there are no bed bugs there – for small infestations, there may not yet be visible signs. So, to be safe, it’s best to leave your suitcase on the suitcase rack (so that it’s up off the ground where there may be bed bugs on the carpet) or else if there isn’t a rack, then in the bathroom on the tiled floors. It’s less likely that bed bugs will be on tiled floors or that they will go into the bathroom much. It’s best if you use a hardcover suitcase (like this one) when you travel as bed bugs are less likely to be able to attach themselves or their eggs to the suitcase on the outside. This lessens the risk that you’ll accidentally get bed bugs from a hotel room or when your luggage is stored near other people’s luggage. When you get home from your travels, you may think you’re now safe especially if you didn’t get any bites. However, many people don’t show any signs of bed bug bites for days after their bitten (some up to 9 days later). And some people never show any marks of having been bitten at all. So it’s best to go through these last few steps to ensure you don’t bring any bed bugs back into your home. Wash your clothes immediately when you get home (including the clothes you’re wearing). Use the hot wash settings and then dry on the hottest temperatures as well. Using some rubbing alcohol, wipe down the inside and outside of your suitcase. Pay particular attention to the area around the zippers as bed bugs like to lodge themselves into crevices. Preventing bed bugs can become an obsessions, so just beware when you get started down this route. While getting bed bugs is a pain to deal with, don’t go overboard with your attempts to prevent them. The best way is to use vigilance and to check hotels before you visit them. Definitely. Storage Buildings are a big concern, because they rarely get treated for bed bugs. I don’t have much experience with active military personnel bringing them home, but there’s no reason they couldn’t. Hi, I live in a three story building, and there was a case of bedbugs on the third floor. We were all told that the tenants in the suite immediately sprayed with alcohol after finding them, and an exterminator came in to spray the suite and the halls of the building. How likely are they to spread to the other suites? And how quickly can they spread? It’s definitely scary when someone else in your building has an infestation. It’s hard to say exactly how likely they are to spread. The larger the infestation, the more likely they will move from one apartment to another. If they took care of the infestation quickly, as they seem to suggest, then it’s fairly unlikely that they’ll spread, but I would be vigilant. One cheap way to watch out for an infestation is to put double-sided tape around your bed legs and around your mattress. This is by no means a fool-proof way of catching bed bugs, especially if you get only a few, but for a larger infestation, it would likely catch a couple. As I said, I would just remain vigilant and act quickly if you do think that they’ve spread to your apartment. One of my students has bedbugs. They came to school with bites on her face and hands. I am worried. Should I be? At the very least, you should be careful. I would thoroughly wash anything you take home from your school, perhaps including your clothes. If you don’t come into close contact with them, then there isn’t really a huge risk, but it is possible for them to get transported to your school and then to your home. hi..it’s been 2 weeks that i have discovered bites on my arms. first week i thought it was from a mosquito today (6/19) i found more bites which also look like a mosquito bite. I have looked around for the flying creature but to no avail. I’m afraid they are bed bug bites but have found no trace of the bed bug. I have read alot of stuff on line on the subject but unless i see traces on my mattress and/or box spring, how can i be absolutely sure? I’m so freaking out about this right now. As soon as I get home from work, I am going to tackle my bed and look for traces. Yes – it can be just as worrisome if you’re unsure about having bed bugs as it is knowing that you have them. I’ve seen many people in the same situation. If it’s causing you enough stress, then you might just try treating like we suggest (with the dry steamer and the diatomaceous earth), so that you get some peace of mind. But you are correct, unless you see bed bugs or traces of bed bugs, it’s nearly impossible to know if the bites are a result of bed bugs or a different insect. another question i forgot to ask. How long does it take to actually detect the signs on mattress? Does the bed bug need to be living there months, days, weeks? Can they live in foam? I have a memory foam cover on my mattress. They can live almost anywhere, and that definitely includes memory foam. It’s not a matter of how long it takes to see signs, it’s more a matter of how big the infestation is. If you only have a few bed bugs, you’re very unlikely to see any signs. On the other hand, if there are hundreds or thousands, then you almost certainly will see signs. my wife and i suspect we were bitten by bed bugs traveling outside the country. the bites seem to be in line patterns. we are worried that we may have brought them home. it has been two nights and we haven’t found any new bites but we inspected at 4 this morning and i found some little flaky crumbles under where i was sleeping and when i touched them they smeared dark red on the white sheet. maybe feces? anyways i would like to be able to catch one if we have them so we can know for sure and take care of things, if i get a mattress cover now will that make it harder to catch one if we have them? would it be better to wait a few more nights to try and catch one before ruling them out and getting a cover anyways? I’m not a huge fan of mattress covers personally, just because I don’t think they protect you all that much (bed bugs can live anywhere around your bed, too), but if it makes you feel better, then I’d go ahead and get one, even before you catch a bug. ok I did see Bedbugs my Daughter was bitten really bad!!! I believe they cam from used wooden bunk besds I bought!!! Akkkkk I have my own mattress’s i have gotton Raid Fogger and Riad spray and intend to clean all materials’ in the room. I have wooden floors, why havent i heard anything about the fogger? I have done it twice in two days, am scared to go in the room Help!!! Can you tell me if diatamacoues earth will kill them at first infestation? I travel alot and was thinking of spreading it in my luggae and in my bedroom just incase I bring some back from a trip. thankyou very much for these complete info, GOD BLESS YOU.